Well it's time for the magic of Autumn, it really is a beautiful season with loads of colours, the days getting shorter and the temperature dropping. This month we will explore some great ideas for family fun as well as some great comfort food you can make with the kids. Just look at how beautiful the U.K is in the Autumn, it's a great time to visit and probably a little cheaper than coming in the summer where it tends to rain anyway. Lets kick our first week off with not one but two great scavenger hunts. The first uses an empty egg box, just print off the free printable, cut it out and stick it on the lid of the egg box. Now you can take a nice fun stroll in your local woods and collect some cool Autumnal finds. There are a couple of items on this scavenger hunt that shouldn't be collected in the box! Please do not add a spider or a squirrel to the box, just find them and leave them where they are. 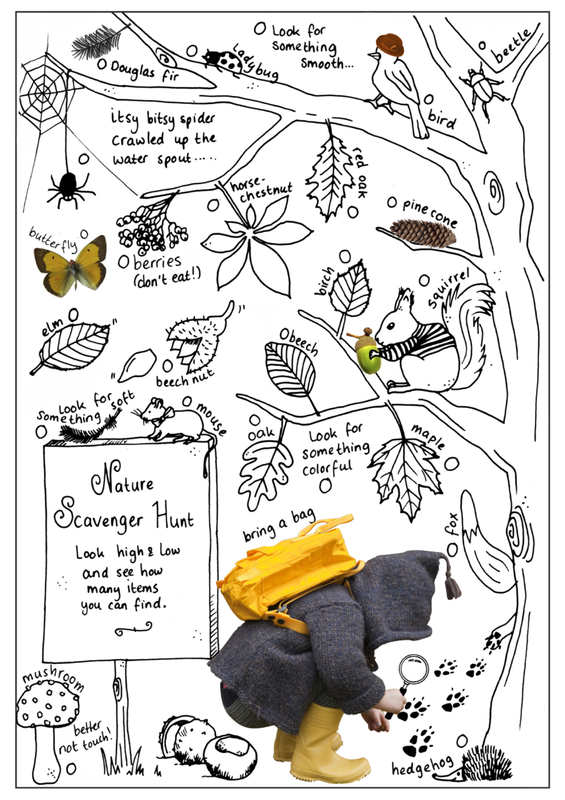 The second scavenger hunt I think would be nice if you are actually somewhere away from home, it doubles up as a colouring sheet and you can just find the items, tick them off and keep the paper on a clipboard or in your pocket. Much easier to carry. So this is a great craft to go along with the scavenger hunts above, whilst you are out in the wild collect loads of autumn leaves, the bigger the better. Maybe some ice big maples leaves will be good. Try to get a good range of colours. Press them as soon as you return from your walk, if you leave it to the next day the leaves will already be crisping and curling and their colour will be fading rapidly. I pressed the leaves for this leaf bowl project between layers of kitchen roll with a sheet of card above and below and a book perched on the top of them all to weigh them down a bit and hurry the process up because I am impatient. They don’t need to be pressed for weeks, they just need to be flat so a few days will do, mine were left for about 10 days and they seemed happy! Once your leaves have been pressed lay them out and choose the ones which have no blemishes, cracks or nibbled bits and carefully snip off the stems. Find a bowl the right size for your leaves, I used a deep round soup bowl for this one and an egg cup for the project you can see at the end of the article. Cover your bowl with a layer of cling film and then paste all over the cling film with a layer of slightly watered down PVA glue (also known as school glue or white glue). Press a layer of leaves onto the gluey cling film, cover with another layer of film and wrap around tightly. Leave overnight. This allows the leaves to soften and mould to the shape of your bowl. Leaves are contrary things and I found that if I didn’t allow them this softening and moulding time they just unfolded and fell off, such drama queens! Remove the top layer of cling film and brush the leaves with a layer of undiluted glue. Carefully choose your next layer of leaves, overlapping the first layer and thinking about colour and shape as you go. With this layer I removed the stalks and cut a V shape into the leaf where they had been to make them more malleable and to stop them misbehaving. Press them onto your gluey leaves and coat them in turn with a layer of glue. Cover again with a tight layer of cling film and leave for a few hours or overnight. Remove the outer layer of cling film, brush with another layer of glue for good measure and leave to dry. Once the glue is dry, take your leaf bowl off your mould and carefully remove the cling film from inside your masterpiece. This is quite tricky, I cut down the cling film and removed it slowly so I didn’t break the fragile trips off the leaves. I found it easier to pull up from the centre of the bowl rather than pull down into it. This was the point which so often happens in crafting when you think something has gone wrong but then realise that something wonderful has happened and the craft has taken on a life of its own! As I removed the last bits of cling film I realised that tiny bits of glue and cling film were being left behind. I reached for my scissors to trim them off but, as I held the bowl up to the light, I gasped – they looked just like ice crystals on a winter leaf! I let them stay. Thats it for this week but before you go check out some of our other recent blog posts below and make sure you come back next week for more Autumnal fun all about the U.K's Bonfire Night.